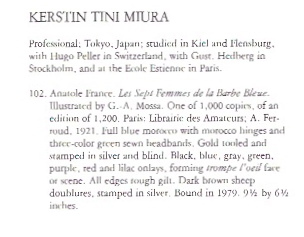 Laid into my copy of the Silvia Rennie catalog is a 1986 letter from Rennie to the recipients of the catalog, in which she refers to Tini Miura: talking to her on the telephone and trying to retrieve the camera that Miura left for her over a year before. I will not be posting it here. Don’t panic. I will not be writing a lecture on copyright law and managed risk. 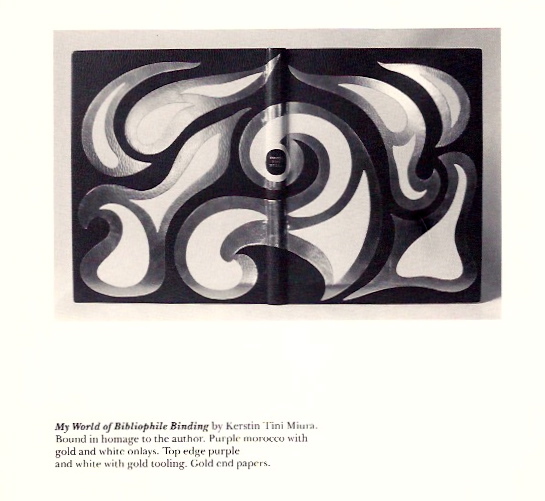 I mention the letter because it demonstrates a point that I was going to get to eventually, but Mark Kirchner reinforced it’s importance in his comment on my Treasures of The Strand, Part 1 post: teaching lineage. As I wrote in the Introduction to this blog, contemporary design binders didn’t spring from nowhere. Tradition and technique are learned from a master binder. Binders teach (or copy) each other. They take students. They teach and take master classes. No one knows everything. There is always more to learn. I could say that the tradition of binding apprenticeships goes back to the invention of the codex. It’s sort of true, but I’d rather not be pompous. Both Silvia Rennie and Tini Miura (and many, many others) studied with the Swiss master binder Hugo Peller. Works of both Rennie and Miura were on display at the GBW 75th Anniversary Exhibition (I’m going to have to abbreviate the exhibit title if I’m going to keep writing about it). At the time of the exhibit, in 1981, Miura had already studied with Peller, but Rennie had not. 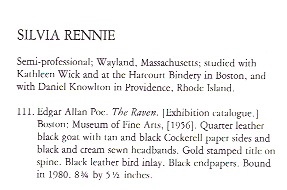 I can’t be sure of the chronology, but it seems to me that Rennie must have studied with Peller in order to have created the work for her solo show in 1985. I don’t know what Rennie and Miura were up to in the early- to mid-eighties. Rennie indicates in her letter that her life was a bit topsy-turvy in late 1984. But they obviously had a quite friendly relationship. 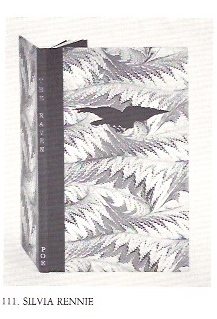 There are many other (US) binders who studied with Hugo Peller. Among them Claudia Cohen, Monique Lallier, … There’s an obituary for Hugo Peller at http://www.philobiblon.com/PellerObit.pdf. A good source of “genealogies” if you will are the binder bios in catalogs (the GBW ones for recent exhibits are online). Tom Conroy has been very active in tracing binder’s genealogies and national traditions – there was an article published in the GBW Journal, XXVIII:1–2, 2 (Spring–Fall 1990). It’s a little out of date at this stage but still very valuable as a starting point.